Russian investigators have forwarded the criminal charges against five suspects involved in the murder of Russian newspaper observer Anna Politkovskaya to court. 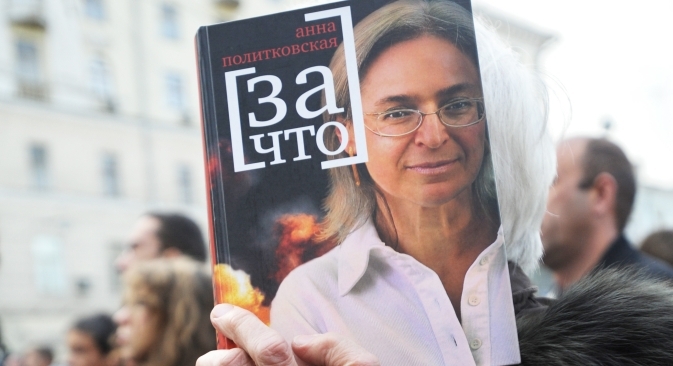 The charges against five people suspected of involvement in the murder of Novaya Gazeta newspaper observer Anna Politkovskaya have been forwarded to court, Russian Investigative Committee spokesman Vladimir Markin said. "The criminal investigation against five persons suspected in Politkovskaya's killing has been completed. They are Lom-Ali Gaitukayev, his nephews Rustam, Ibragim and Dzhabrail Makhmudov, as well as Sergei Khadzhikurbanov," Markin said. They face charges of murder and illegal possession of weapons, he said. On April 18 the Investigative Committee said it had launched the criminal case against the five suspects to the Prosecutor General's Office to approve the indictment and then to forward it to court. The criminal case against another suspect in the case, Dmitry Pavlyuchenkov, who concluded a pre-trial cooperation agreement, was separated. Pavlyuchenkov has been sentenced to 11 years in maximum security penal colony for assistance in organizing the murder of Politkovskaya. Investigators believe that Lom-Ali Gaitukayev organized the crime. He created the group comprising other suspects in 2006. According to the Investigative Committee's information, the group then planned the murder of Politkovskaya in great detail, purchased weapons and coordinated actions, while "Khadzhikurbanov controlled all actions of the group." "Having received the information where the victim lived from D. Pavlyuchenko, the Makhmudov brothers went to her route on October 7, 2006. Having seen the victim driving, I. Makhmudov informed his brother Dzhabrail, who then told Rustam, who went to the entrance of the building where Politkovskaya lived and started waiting for her to arrive," the Investigative Committee said. According to investigators' information, when Politkovskaya stepped into the elevator, R. Makhmudov shot her several times. "The crime instrument was left at the scene. The suspects fled after this," the Investigative Committee said. Former Central Internal Affairs Directorate employee Khadzhikurbanov is serving time for another case. He was brought to Moscow to participate in the Politkovskaya murder case. According to the law, the court is to impose a pre-trial restraint to sanction Khadzhikurbanov's detention. In December 2012 Petros Garibyan, investigator for especially important cases under the Investigative Committee chairman, said on air on the Echo of Moscow (Ekho Moskvy) radio station that investigative authorities intended to find out in 2013 who ordered the murder of Politkovskaya. "The person who ordered the hit will be found as well," Garibyan said back then. At the same time, Garibyan said that the person was not related to higher authorities. "I am astounded by the wish of your colleagues to catch this and to write this. Well, there is nothing like that," he said when asked about allegations that the murder of Politkovskaya was leading all the way up to the Kremlin.